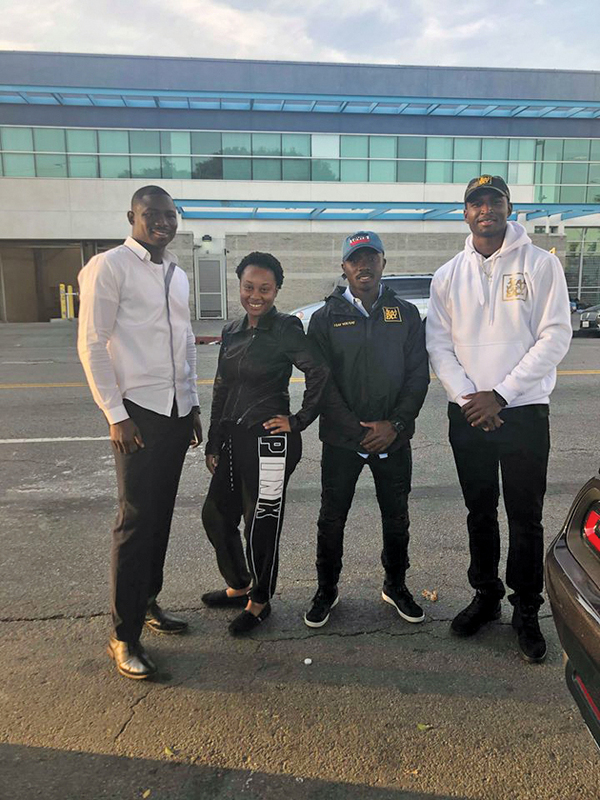 PFC Abdulai Abdul Razak Ibraham, PFC Cierra Burks, SPC Osei-mensah Samuel and Sgt. Shaquille Gardner handed prepared more than 250 food bags to hand out to residents of Los Angeles’ Skid Row. 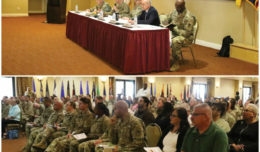 FORT IRWIN — When Sgt. Shaquille Gardner was a child, he would visit Los Angeles, but his grandfather would avoid taking him near certain parts of the city. Years later the Birmingham, Alabama, native now lives in Fort Irwin and visited a controversial part of LA, known as Skid Row and said it was an eye-opening experience. “If you ever visit, you’ll see it needs help, you know it needs change,” he said. On any given day or night, about 2,000 of the city’s homeless line the blocks that make up downtown’s Skid Row. Gardner jumped into action to help. “When I really learned the background of Skid Row, I realized there were a lot of people who are less fortunate than you and I and they’re not quote-on-quote ‘homeless,’ they’ve just been in bad situations,” he said. Gardner and his business partner Trevail Lee decided to take food down to that area in September of 2018 but said they didn’t realize how huge a need it was for them. 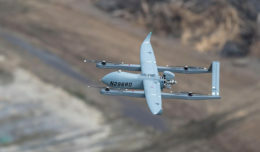 He then went to social media to recruit more volunteers and posted to the Fort Irwin Connection Facebook page, requesting anyone interested in community service to contact him. He also asked for donations to provide to the homeless population on Skid Row. 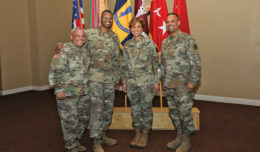 This past December, a group of three people joined Sgt. Gardner and went back to Skid Row to volunteer and he said this time, they were better prepared. The Fort Irwin community donated clothes, shoes and food items. Volunteers prepared more than 250 goodie bags, complete with hotdogs, hamburgers, potato chips, snacks and a bottled water. 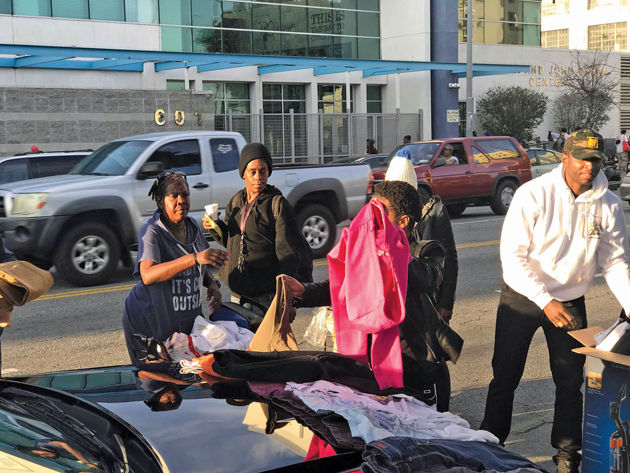 They walked about four blocks of Skid Row, also providing blankets to those in wheelchairs and distributing clothes to about 50 people, including children. Sgt. Gardner said the volunteers didn’t know what they were getting into at first but knew it was for a good cause and would be a blessing to others. His most memorable moment on Skid Row revolved around a pair of shoes. 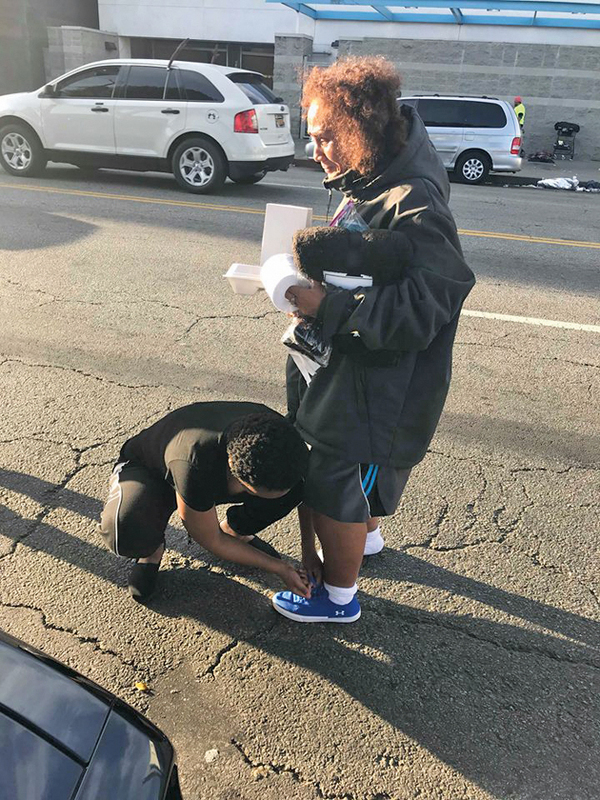 He said the homeless individual said she had not had shoes in almost two months and immediately felt better after receiving the shoes. Gardner said he brings his passion for helping others everywhere he goes. There, Gardner had conversations and did activities with those in the home. Back on Skid Row, Gardner talks about how some people try to ignore the homeless population there but said he encourages people not to judge them. He says they’ve just been in situations where they can’t get out of. Gardner spoke of Skid Row resident, Mr. Joe, who he plans to help get back on his feet, starting with a simple haircut. He and Mr. Joe connected through their southern roots, as Mr. Joe is from Mississippi. Mr. Joe is in a wheelchair and has lived on Skid Row for 25 years, following a bad divorce. Gardner said most of the people he met on Skid Row have families of five and others are single and just found themselves in bad situations; others are dealing with deep-rooted personal issues, involving drugs and alcohol. “I can’t judge them for that but my purpose in what I do is I try to give back and let them know there is hope and people who really care about others and their situations,” Gardner said. Gardner plans to make another trip with volunteers to Skid Row this summer. If you’d like to donate items or your time, you can reach him on Facebook under Shaquille Gardner or his organizational page IEYE, Inc. You can also email him at gardnershaquille@yahoo.com. PFC Cierra Burks brings a woman to tears, as she gives her shoes. The woman said she had not worn shoes in months. The Fort Irwin community donated clothing and food items to help support the volunteers’ mission of helping those who are less fortunate. Volunteer organizer Sgt. 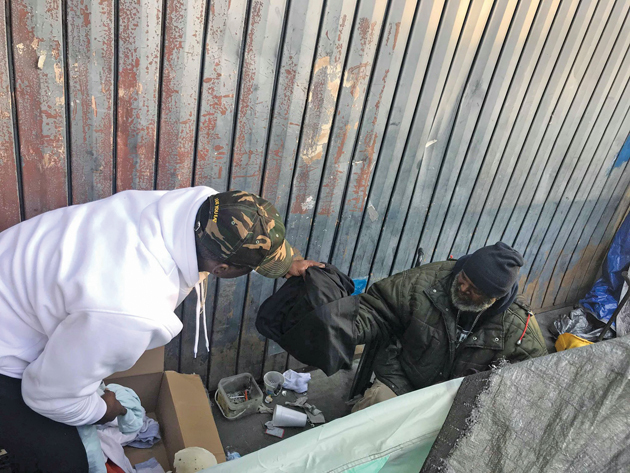 Shaquille Gardner hands items to a man he formed a bond with, who has lived on Skid Row for 25 years.